FIIA has launched four new Government-funded research projects. 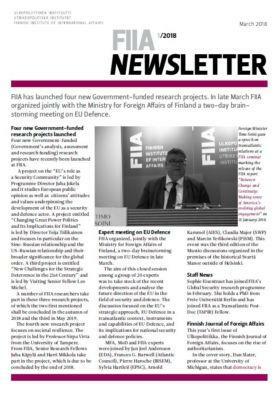 In late March FIIA organized jointly with the Ministry for Foreign Affairs of Finland a two-day brainstorming meeting on EU Defence. Four new Government-funded (Government’s analysis, assessment and research funding) research projects have recently been launched at FIIA. A project on the “EU’s role as a Security Community” is led by Programme Director Juha Jokela and it studies European public opinion as well as citizens’ attitudes and values underpinning the development of the EU as a security and defence actor. A project entitled “Changing Great Power Politics and Its Implications for Finland” is led by Director Teija Tiilikainen and focuses in particular on the Sino-Russian relationship and the US-Russian relationship and their broader significance for the global order. A third project is entitled “New Challenges for the Strategic Deterrence in the 21st Century” and is led by Visiting Senior Fellow Leo Michel. A number of FIIA researchers take part in these three research projects, of which the two first mentioned shall be concluded in the autumn of 2018 and the third in May 2019. The fourth new research project focuses on societal resilience. The project is led by Professor Sirpa Virta from the University of Tampere. From FIIA, Senior Research Fellows Juha Käpylä and Harri Mikkola take part in the project, which is due to be concluded by the end of 2018. FIIA organized, jointly with the Ministry for Foreign Affairs of Finland, a two-day brainstorming meeting on EU Defence in late March. The aim of this closed session among a group of 20 experts was to take stock of the recent developments and analyse the future direction of the EU in the field of security and defence. The discussion focused on the EU’s strategic approach, EU Defence in a transatlantic context, instruments and capabilities of EU Defence, and its implications for national security and defence policies. MFA, MoD and FIIA experts were joined by Jan Joel Andersson (EDA), Frances G. Burwell (Atlantic Council), Pierre Haroche (IRSEM), Sylvia Hartleif (EPSC), Arnold Kammel (AIES), Claudia Major (SWP) and Marcin Terlikowski (PiSM). This event was the third edition of the Mustio discussions organized in the premises of the historical Svartå Manor outside of Helsinki. Sophie Eisentraut has joined FIIA’s Global Security research programme in February. She holds a PhD from Freie Universität Berlin and has joined FIIA as a Transatlantic Post-Doc (TAPIR) Fellow . This year’s first issue of Ulkopolitiikka, the Finnish Journal of Foreign Affairs, focuses on the rise of authoritarianism. In the cover story, Dan Slater, professor at the University of Michigan, states that democracy is no longer safe anywhere. The article investigates how authoritarian measures are getting stronger even within the European Union, not to mention Russia and Turkey. In Hungary prime minister Viktor Orbán is building an illiberal state. Poland is in dispute with the EU in relation to the practice of rule of law. Ulkopolitiikka also tells how US President Trump did not manage to drain the swamp in Washington, but gave instead more power to the lobbies. The Journal is available both as a printed journal and as an e-paper at lehtiluukku.fi. A new government takes office in Berlin: What prospects for Franco-German leadership in the EU? Uncertainty in the Italian election: Towards a political stalemate? Trump’s first year at the helm: Towards a zero-sum world?